MSD880 Microstepping Drive / Stepper Drives / Motion Control Products Ltd.
As a replacement model to our old MSD980, MSD880 is a high performance microstepping drive based on pure-sinusoidal current control technology. Owing to the above technology and the self-adjustment technology (self-adjust current control parameters) according to different motors, the driven motors can run with reduced noise, lower heating, smoother movement and better performance at higher speed than most of the drives in the market. 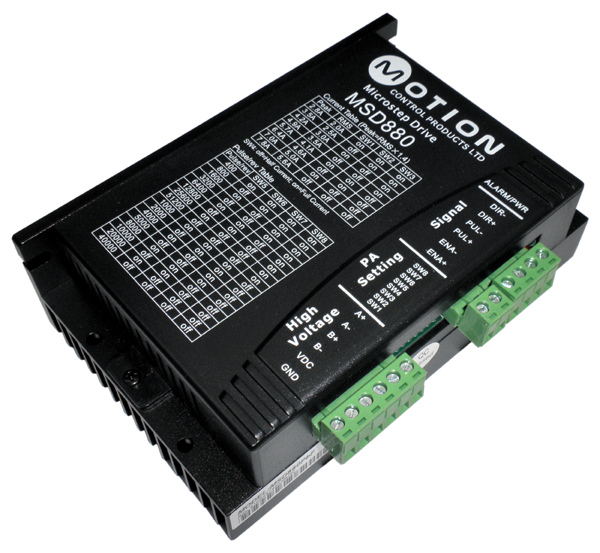 It is suitable for driving 2-phase and 4-phase hybrid stepper motors. The MSD880 stepper drive is suitable for a wide range of stepping motors including our FL57, M60, FL86 and the FL110 and are ideal for any application that requires a high performance but very low cost Microstepping drive.